Population Ranked 5th in the U.S. The State of Illinois is a state of the United States of America, the 21st to be admitted to the Union. Illinois is the most populous state in the Midwest and the fifth most populous in the nation, and has a large and cosmopolitan population. Its balance of vast suburbs and the great metropolis of Chicago in the northeast, rural areas, small industrial cities, renowned agricultural productivity in central and western Illinois, and the coal mines of the south give it a highly diverse economic base. Its central location, connecting the Great Lakes to the Mississippi River via the Illinois River and the I and M Canal, have made it a transportation hub for 150 years. It is this mixture of factory and farm, urban and rural, that makes Illinois a microcosm of the United States. An Associated Press analysis of 21 demographic factors determined Illinois was the "most average state." About 2,000 Native American hunters and a small number of French villagers inhabited the area at the time of the American Revolution. American settlers began arriving from Kentucky in the 1810s; they achieved statehood in 1818. Later settlers arrived and dominated the north, founding Chicago in the 1830s. The coming of the railroads in the 1850s made highly profitable the rich prairie farmlands in central Illinois, attracting large numbers of immigrant farmers from Germany and Sweden. Northern Illinois provided major support for Illinoisans Abraham Lincoln and Ulysses S. Grant during the American Civil War. By 1900, factories were being rapidly built in the northern cities, along with coal mines in central and southern areas. This industrialization attracted large numbers of immigrants from Eastern and Southern Europe, and also led to the state's material contribution as a major arsenal in both world wars. In addition to immigrants from Europe, large numbers of African-Americans left the cotton fields of the South to work in Chicago's factories and foundries. The state is named for the French adaptation of an Algonquian language (perhaps Miami) word apparently meaning "s/he speaks normally" (Miami ilenweewa, Proto-Algonquian *elen-, "ordinary" and -wē, "to speak"). Alternately, the name is often associated with the indigenous Illiniwek people, a consortium of Algonquian tribes that thrived in the area. The name Illiniwek is frequently said to mean "tribe of superior men"; in reality, it only means "men." The northeastern border of Illinois is Lake Michigan. Its eastern border with Indiana is the Wabash River north to Vincennes, Indiana, and a north-south line above Post Vincennes at 87° 31′ 30″ west longitude. The northern border with Wisconsin is fixed at 42° 30' north latitude. The Mississippi River forms the western border with Missouri and Iowa. The Ohio River to the south is the border with Kentucky. A boundary line through Lake Michigan represents Illinois's border with Michigan, but only via a water boundary in Lake Michigan. Illinois has three major geographical divisions. The first, Northern Illinois, is dominated by the Chicago metropolitan area, including the city of Chicago, its suburbs, and the adjoining exurban area. As defined by the federal government, the Chicago metro area includes a few counties in Indiana and Wisconsin and stretches across much of northeastern Illinois. The region is cosmopolitan, densely populated, industrialized, and settled by a wide variety of ethnic groups. The second major division is Central Illinois, an area of mostly flat prairie, south and west of the metropolitan area, characterized by small towns and mid-sized cities. The western section (west of the Illinois River) was originally part of the Military Tract of 1812 and forms the distinctive western bulge of the state. Agriculture, particularly corn and soybeans, as well as educational institutions and manufacturing centers, figure prominently. Cities include Peoria (the third largest metropolitan area in Illinois at 370,000), Springfield (the state capital), Quincy, Decatur, Bloomington-Normal, and Champaign-Urbana. The third division is Southern Illinois, all of the area south of U.S. Route 50, including Little Egypt, near the confluence of the Mississippi River and Ohio River. This region has a warmer climate, a different mix of crops (including some cotton farming in the past), and more rugged topography. The southern tip of Illinois was unglaciated; most of the rest of the state was glaciated during the Illinoian Age and earlier ages. There are small-scale oil deposits and coal mining as well. The area is a little more populated than the central part of the state with the population centered in two areas. First, the Illinois suburbs of Saint Louis comprise the second most populous metropolitan area in Illinois with nearly 600,000 inhabitants, and are known collectively as the Metro-East. The second area is Williamson County, Jackson County, Franklin County, Saline County and Perry County, home to around 210,000 residents. The ancient city of Cahokia sits on the floodplain of the Mississippi River, between the towns of Alton and the Kaskaskia. It was a region of early French settlement, as well as the site of the first state capital, at Kaskaskia which is separated from the rest of the state by the Mississippi River. Because of its nearly 400 mile (640 km) length and mid-continental situation, Illinois has a widely varying climate. Most of Illinois has a humid continental climate (Koppen climate classification Dfa) with hot, humid summers and cool to cold winters. The southernmost part of the state, from about Carbondale southward, borders on a humid subtropical climate (Koppen Cfa) with more moderate winters. Average yearly precipitation for Illinois varies from just over 48 inches (1,220 mm) at the southern tip to around 35 inches (890 mm) in the northern portion of the state. Normal annual snowfall exceeds 38 inches (96 cm) in Chicagoland, while the southern portion of the state normally receives less than 14 inches (35 cm). The highest temperature recorded in Illinois was 117°F (47°C), recorded on July 14, 1954, at East St. Louis, while the lowest temperature was -36°F (-38°C), recorded on January 5, 1999, at Congerville. Illinois averages around 50 days of thunderstorm activity a year putting it somewhat above the average for the United States. The state is vulnerable to tornadoes with an average of 35 annually. The deadliest tornado on record in the nation struck largely in Illinois. The Tri-State Tornado of 1925 killed 695 people in three states; 613 of the victims lived in Illinois. 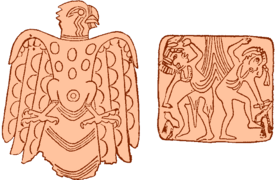 Cahokia, the center of the pre-Columbian Mississippian culture that, at its height, reached from present-day Minnesota to Florida, was located near present-day Collinsville, Illinois. Cahokia had a population of over 20,000 around 800 to 900 C.E. and spread over six square miles (15.5 km²). That civilization vanished in the 15th century for unknown reasons. The next major power in the region was the Illiniwek Confederation, or Illini, a political alliance among several tribes. There were about 25,000 Illinois in 1700, but systematic attacks resulted in genocide by the Iroquois reducing their numbers by 90 percent. Members of the Potawatomi, Miami, Sauk, and other tribes came in from the east and north. During the American Revolution, the Illinois and Potawatomi supported the American cause. French explorers Jacques Marquette and Louis Jolliet explored the Illinois River in 1673. As a result of their exploration, Illinois was part of the French empire until 1763, when it passed to the British. The small French settlements continued; a few British soldiers were posted in Illinois but there were no British or American settlers. In 1778 George Rogers Clark claimed the Illinois Country for Virginia. The area was ceded by Virginia to the new United States in 1783 and became part of the Northwest Territory. The Illinois-Wabash Company was an early claimant to much of Illinois. The Illinois Territory was created on February 3, 1809, with its capital at Kaskaskia. In 1818, Illinois became the 21st U.S. state after exaggerating its population totals. The new state debated slavery then rejected it, as settlers poured into southern Illinois from Kentucky. Thanks to Nathaniel Pope, the delegate from Illinois, Congress shifted the northern border 41 miles north to 42° 30' north, which added 8,500 square miles to the state, including Chicago, Galena and the lead mining region. The capital remained at Kaskaskia, but in 1819 it was moved to Vandalia. In the 1832 Black Hawk War tribes that had removed to Iowa attempted to return, but were defeated by the militia and forced back to Iowa. The winter of 1830-1831 is called the "Winter of the Deep Snow." A sudden, deep snowfall blanketed the state, making travel impossible for the rest of the winter. Many travelers perished. 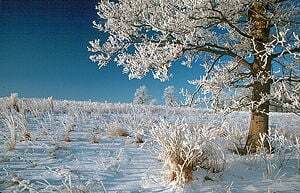 Several severe winters followed, including the "Winter of the Sudden Freeze." On December 20, 1836, a fast-moving cold front passed through, freezing standing water in minutes and killing many travelers who could not reach shelter. The adverse weather resulted in crop failures in the northern part of the state. The southern part of the state shipped food north, which may have contributed to its name: "Little Egypt," after the Biblical story of Joseph in Egypt supplying grain to his brothers. Illinois is known as the "Land of Lincoln" because the 16th President spent most of his life here, practicing law and living in Springfield. In 1837, with Lincoln's support and urging, the General Assembly voted to move the capital to Springfield. Illinois was not a strong anti-slavery state. In 1853, led by Democrat John A. Logan, the legislature passed a Black Code designed to keep free blacks out of the state. By 1839 the Mormon utopian city of Nauvoo, located on the Mississippi River, was created and settled, and flourished. In 1844 the Mormon leader Joseph Smith was killed in the Carthage, Illinois jail. After nearly six years of rapid development, Nauvoo, which rivaled Chicago as Illinois' largest city, saw a rapid decline. In 1846 the Mormons left Illinois for the West in a mass exodus. Chicago gained prominence as a Great Lakes port and then as an Illinois and Michigan Canal port after 1848, and as a rail hub soon afterward. By 1857, Chicago was Illinois' largest city, its location a major factor in its rapid growth. Natural resources and raw materials poured into Chicago from the central plains and were transformed into finished goods to be shipped to the population centers in the East. Grain, lumber, and livestock were the foundation to the nineteenth century Chicago; the expansion of the railroads and innovations such as refrigerator railcars meant that Chicago could ship food products farther and capture new markets. Emigrants provided the labor; poor working conditions and exploitation exposed by so-called Muckrakers like Upton Sinclair led to labor activism. The Haymarket Riots of May 1 - 4, 1886, a mass demonstration demanding an eight-hour work day resulted in the death of a police officer. Eight participants were convicted and sentenced to death for inciting the riots; four were hanged, one committed suicide in prison, and the three remaining had their sentences commuted to life imprisonment. The brutal treatment of the demonstrators led to worldwide calls for clemency for those convicted; May 1 was designated as International Workers Day to commemorate the events of May 1886. During the American Civil War Illinois was a major source of troops for the Union army (particularly for those armies serving in the Western Theater), as well as military supplies, food, and clothing. Situated strategically near major rivers and railroads, the state became a major jumping off place early in the war for Ulysses S. Grant's efforts to seize control of the Mississippi and Tennessee rivers. Illinois contributed 250,000 soldiers to the Union Army, ranking it fourth in terms of the total manpower in Federal military service. Illinois troops predominantly fought in the Western Theater, although a few regiments played important roles in the East, particularly in the Army of the Potomac. Several thousand Illinoisians were killed or died of their wounds during the war, and a number of national cemeteries were established in Illinois to bury their remains. Besides President Lincoln, a number of other Illinois men became prominent in the army or in national politics, including Ulysses S. Grant (a resident when the war started), John M. Schofield and John A. Logan. No major battles were fought in the state, although several river towns became sites for important supply depots and "brownwater" navy yards. Several prisoner of war camps and prisons dotted the state, processing thousands of captive Confederate soldiers. In the twentieth century, Illinois emerged as one of the most important states in the union with a population of nearly five million. By the end of the century, the population would reach 12.4 million. The Century of Progress world's fair was held at Chicago in 1933. Oil strikes in Marion County and Crawford County lead to a boom in 1937, and, by 1939, Illinois ranked 4th in U.S. oil production. Following World War II, Argonne National Laboratory, near Chicago, activated the first experimental nuclear power generating system in United States in 1957. By 1960, the first privately financed nuclear plant in United States, Dresden 1, was dedicated near Morris. Chicago became an ocean port with the opening of the Saint Lawrence Seaway, in 1959. The seaway and the Illinois Waterway connected Chicago to both the Mississippi River and the Atlantic Ocean. In 1960, Ray Kroc opened the first McDonald's franchise in Des Plaines. In 1970, the state's sixth constitutional convention authored a new constitution to replace the 1870 version. It was ratified in December. The first Farm Aid concert was held in Champaign to benefit American farmers, in 1985. The worst upper Mississippi River flood of the century, the Great Flood of 1993, inundated many towns and thousands of acres of farmland. Springfield is Illinois' capital city and the county seat of Sangamon County. The city was home to 111,454 people according to the U.S. Census of 2000. Settled in the late 1810s, the town was originally called "Calhoun" after Vice President John C. Calhoun; as public sentiment turned against Calhoun the city was renamed Springfield. Abraham Lincoln is one of the city's most important and prominent past residents, he moved to the area in 1831 and lived in Springfield itself from 1837 until 1861. Former U.S. President Ulysses S. Grant also lived briefly in Springfield (1861). 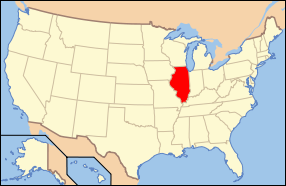 The state government of Illinois is formed after the Kentucky model with some adaptations. As codified in the state constitution, there are three branches of government: executive, legislative, and judicial. The executive branch is led by the Governor. 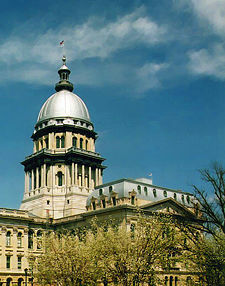 Legislative functions are given to the Illinois General Assembly, composed of the 118-member Illinois House of Representatives and the 59-member Illinois Senate. The judiciary is comprised of the Supreme Court of Illinois, which oversees the lower appellate and circuit courts. Historically, Illinois has been a major battleground state between the Republican Party and the Democratic Party. As evidenced by increasing Democratic margins in recent elections, it has gradually shifted more Democratic at the national and state level, and now leans solidly Democratic in national elections to become the most Democratic state in the Midwest. Traditionally Cook, Rock Island, Madison, and St. Clair (near St. Louis) counties have been Democratic strongholds, while the suburbs of Chicago and most of the rest of the state have been historically Republican. Both Lake County and DuPage County, locally referred to as the "collar counties," while still mostly Republican, have been trending towards the Democrats. Small cities and towns are typically Republican strongholds. Illinois voted for Democratic presidential candidates in the last four elections. John Kerry easily won the state's 21 electoral votes in 2004 by a margin of 11 percentage points with 54.8 percent of the vote despite winning outright in only 15 of 102 counties. Illinois has the unique distinction of having popularly elected two of the five African-Americans who have served in the US Senate: Carol Moseley-Braun and Barack Obama. The 2004 total gross state product for Illinois was nearly $522 billion USD, placing it 5th highest in the nation. The 2004 per capita income was $34,721 USD. Illinois's state income tax is calculated by multiplying net income by a flat rate, currently 3 percent. There are two rates for state sales tax: 6.25 percent for general merchandise and 1 percent for qualifying food, drugs and medical appliances. The property tax is the largest single tax in Illinois, and is the major source of tax revenue for local government taxing districts. The property tax is a local—not state—tax, imposed by local government taxing districts. The property tax in Illinois is imposed only on real property. Illinois's agricultural outputs are corn, soybeans, hogs, cattle, dairy products, and wheat. In most years it is the leading state for the production of soybeans, with a harvest of 500 million bushels in 2004. Illinois is ranked second in total corn production. The state's universities are actively researching alternative crops. As of 2004, the leading manufacturing industries in Illinois, based upon value-added, were chemical manufacturing ($16.6 billion), food manufacturing ($14.4 billion), machinery manufacturing ($13.6 billion), fabricated metal products ($10.5 billion), plastics and rubber products ($6.8 billion), transportation equipment ($6.7 billion), and computer and electronic products ($6.4 billion). Important non-manufacturing industries include financial services, publishing, petroleum, and coal. Illinois is ranked second in corn production among U.S. states, and Illinois corn is used to produce 40 percent of the ethanol consumed in the United States. 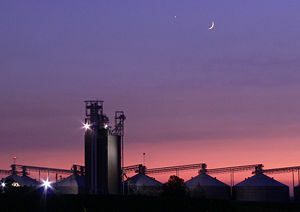 The Archer Daniels Midland corporation in Decatur, Illinois is the world's leading producer of ethanol from corn. University of Illinois at Urbana-Champaign is one of the partners in the Energy Biosciences Institute (EBI), a $500 million biofuels research project funded by petroleum giant BP. Illinois Gov. Rod Blagojevich recently announced a $25 million grant program to fund the construction of five new ethanol and biodiesel plants in Illinois. Illinois is a net importer of fuels for energy, despite large coal resources and some minor oil production. The state is ranked fifth among states in electricity production and seventh in electricity consumption. About 68 percent of Illinois has coal-bearing strata of the Pennsylvanian geologic period. According to the Illinois State Geological Survey, 211 billion tons of bituminous coal are estimated to lie under the surface, having a total heating value greater than the estimated oil deposits in the Arabian Peninsula. However, this coal has a high sulfur content, which causes acid rain unless special equipment is used to reduce sulfur dioxide emissions. Many Illinois power plants are not equipped to burn high-sulfur coal. In 1999, Illinois produced 40.4 million tons of coal, but only 17 million tons (42 percent) of Illinois coal was consumed within the state. Most of the coal produced in Illinois is exported to other states, while much of the coal burned for power in Illinois (21 million tons in 1998) is mined in the Powder River Basin of Wyoming. The towns of Mattoon and Tuscola are being considered as sites for the Department of Energy's FutureGen project, a 275 megawatt experimental zero emission coal-burning power plant. Illinois is a leading refiner of petroleum in the American Midwest, with a combined crude oil distillation capacity of nearly 0.9 million barrels per day. However, Illinois has very limited crude oil proved reserves that account for less than 1 percent of U.S. crude oil proved reserves. Residential heating is 81 percent natural gas compared to less than 1 percent heating oil. Illinois is ranked 14th in oil production among states, with a daily output of approximately 28,000 barrels in 2005. The sample version of the current Illinois passenger license plate introduced in 2001. Because of its central location and its proximity to the Rust Belt and Grain Belt, Illinois is a national crossroads for rail, auto, and truck traffic. Chicago's O'Hare International Airport (ORD) is one of the busiest airports in the world, with 62 million domestic and 12 million international passengers annually. Chicago Midway International Airport (MDW) is the secondary airport serving metro Chicago, with 19 million passengers in 2006. Illinois has an extensive rail network transporting both passengers and freight. Chicago is a national Amtrak hub. Nearly every North American railway meets at Chicago, making it one of the largest and most active rail hubs in the world. Extensive commuter rail is provided in the city proper and immediate northern suburbs by the Chicago Transit Authority's 'L' system. The largest suburban commuter rail system in the United States, operated by Metra, uses existing rail lines to provide direct commuter rail access for hundreds of suburbs to the city and beyond. Major U.S. Interstate highways crossing the state include: I-24, I-39, I-55, I-57, I-64, I-70, I-72, I-74, I-80, I-88, I-90, and I-94. In addition to the state's rail lines, the Mississippi River and Illinois River provide major routes for the state's agricultural interests. Lake Michigan connects Illinois to all waterways east. 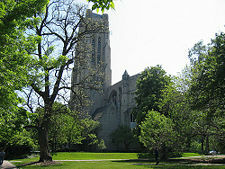 Rockefeller Chapel, constructed in 1928, is the tallest structure on the University of Chicago campus. 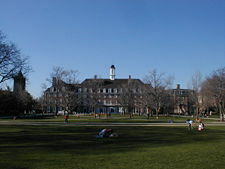 The main quad at the University of Illinois at Urbana-Champaign. The Illinois State Board of Education or ISBE, autonomous of the governor and the state legislature, administers public education in the state. Local municipalities and their respective school districts operate individual public schools but the ISBE audits performance of public schools with the Illinois School Report Card. The ISBE also makes recommendations to state leaders concerning education spending and policies. In 2007, Illinois ranked fourth in the nation for having the highest number of teachers achieving National Board Certification, the highest credential in the teaching profession. Education is compulsory from kindergarten through the twelfth grade in Illinois, often divided into three tiers of primary and secondary education: elementary school, middle school or junior high school and high school. District territories are often complex in structure. Education has always been a high priority in Illinois, as attested by the large number of colleges and universities in the state. The three most prominent research universities are the University of Chicago, Northwestern University, and the University of Illinois at Champaign-Urbana, the latter being the only public university of the three. Other public universities include the University of Illinois at Chicago and Springfield (which are branches of the University of Illinois System), as well as Illinois State University (1857), Southern Illinois University (1869), Northern Illinois University (1895), Eastern Illinois University (1895), and Western Illinois University (1899). Illinois supports 49 public community colleges in the Illinois Community College System, as well as dozens of private colleges and universities. In 2006, Illinois had an estimated population of 12,831,970, which was an increase of 65,200 from the prior year and an increase of 412,323, or 3.3 percent, since the year 2000. This includes a natural increase of 481,799 people (that is 1,138,398 births minus 656,599 deaths) since the last census and a decrease due to net migration out of the state of 71,456 people. Immigration from outside the United States resulted in an increase of 402,257 people, and migration within the country produced a loss of 473,713 people. In 2004, 13.3 percent of the population (1,682,900 people) was foreign born. The five largest ancestry groups in Illinois are: German American (19.6 percent), African-American (15.1 percent), Irish American (12.2 percent), Mexican American (9.2 percent), and Polish-American (7.5 percent). Nearly three in ten whites in Illinois claimed at least partial German ancestry on the Census. Blacks are present in large numbers in the city of Chicago, East St. Louis, and the southern tip of the state. Residents citing American and British ancestry are especially concentrated in the southeastern part of the state. 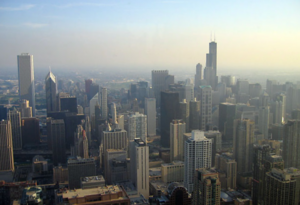 Metropolitan Chicago has the greatest numbers of people of Irish, Mexican, and Polish ancestry. At the northern edge of the state on Lake Michigan lies Chicago, the largest city in the state and the third most populous city in the United States. The 2000 census listed 65.6 percent of the state's population in the counties containing the Chicago metro area: Cook, Will, DuPage, Kane, Lake, and McHenry Counties. The balance of the population lives in the smaller cities and in the rural areas that dot the state's plains. 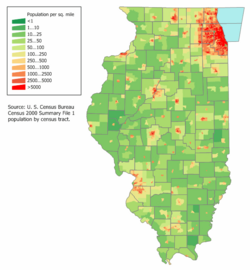 The United States Census Bureau's 2005 estimate lists six other cities with populations of over 100,000 within Illinois. Two of these are Chicago suburbs: Aurora (168,181) and Naperville (141,579). The largest city in the state not located within the Chicago metropolitan area is Rockford (152,916), while Joliet, a city southwest of Chicago, is fourth in size (136,208). The state's capital city, Springfield is fifth (115,668), and Peoria, which decades ago was actually the second largest city in the state was number six in 2005 (112,685). Protestants are the largest religious group in Illinois. However, Illinois is not as heavily Protestant as neighboring states are. Roman Catholics, who are heavily concentrated in and around Chicago, account for 30 percent of the population. Chicago and its suburbs are also home to a large population of Hindus, Jewss, Muslims and Sikhs. 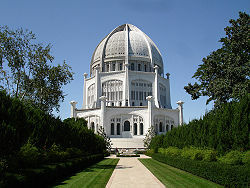 Wilmette is home to one of the seven Baha'i temples in the world, the Baha'i House of Worship for the North American Continent. Illinois has many museums, including the Burpee Museum of Natural History in Rockford, featuring the dinosaur fossil "Jane the Rockford T-Rex." The state-of-the-art Abraham Lincoln Presidential Library and Museum in Springfield is the largest presidential library in the country. Many museums in Chicago are considered some of the best in the world. These include the John G. Shedd Aquarium, the Field Museum of Natural History, the Art Institute of Chicago, and the Museum of Science and Industry. The Museum of Science and Industry is the only building remaining from the 1893 Columbian Exposition held in Chicago to celebrate the 400th anniversary of Columbus' discovery of the new world. The Illinois state parks system began in 1908 with what is now Fort Massac State Park. The Illinois state parks system encompasses over 60 parks and about the same number of recreational and wildlife areas. Areas under the protection and control of the National Park Service include the Illinois and Michigan Canal National Heritage Corridor near Lockport, the Lewis and Clark National Historic Trail, the Lincoln Home National Historic Site in Springfield, the Mormon Pioneer National Historic Trail, and the Trail of Tears National Historic Trail. George Wendt (born 1948), actor, best known for the role of Norm Peterson on the television show Cheers. ↑ (5 ILCS 460/20) (from Ch. 1, par. 2901‑20) State Designations Act.. Illinois Compiled Statutes. Illinois General Assembly (September 4, 1991). Retrieved April 10, 2009. ↑ Illinois Table: QT-P16; Language Spoken at Home: 2000. Data Set: Census 2000 Summary File 3 (SF 3) – Sample Data. U.S. Census Bureau (2000). Retrieved April 10, 2009. ↑ Median Household Income (In 2007 Inflation-Adjusted Dollars) Universe: Households. 2007 American Community Survey 1-Year Estimates. U.S. Census Bureau (2007). Retrieved April 9, 2009. Cronon, William. 1991. Nature's Metropolis: Chicago and the Great West. New York: W.W. Norton. ISBN 0393308731. Finley, Robert. 2001. Illinois in the Global Energy Marketplace. Illinois State Geological Survey publication. Hallwas, John E. 1986. Illinois literature the nineteenth century. Macomb, Ill. (P.O. Box 25, Macomb 61455): Illinois Heritage Press. Horsley, A. Doyne (1986). Illinois: A Geography. Westview Press. ISBN 0865315221. Kilduff, Dorrell, and C. H. Pygman. 1962. Illinois; history, government, geography. Chicago: Follett. (1978) in Nelson, Ronald E. (ed. ): Illinois: Land and Life in the Prairie State. ISBN 0840318316. Data Profile: Illinois. U.S. Census Bureau. Retrieved November 21, 2007. Gross Domestic Product by State in 2005. Bureau of Economic Analysis. Retrieved November 21, 2007. Illinois Nuclear Industry. Energy Information Administration. Retrieved November 21, 2007. Illinois Temperature Extremes. Midwestern Regional Climate Center. Retrieved November 21, 2007. 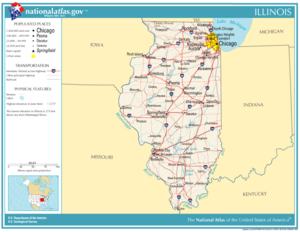 State & County QuickFacts: Illinois. U.S. Census Bureau. Retrieved November 21, 2007. State Personal Income for 2005. Bureau of Economic Analysis. Retrieved November 21, 2007. This page was last modified on 25 February 2018, at 21:18.